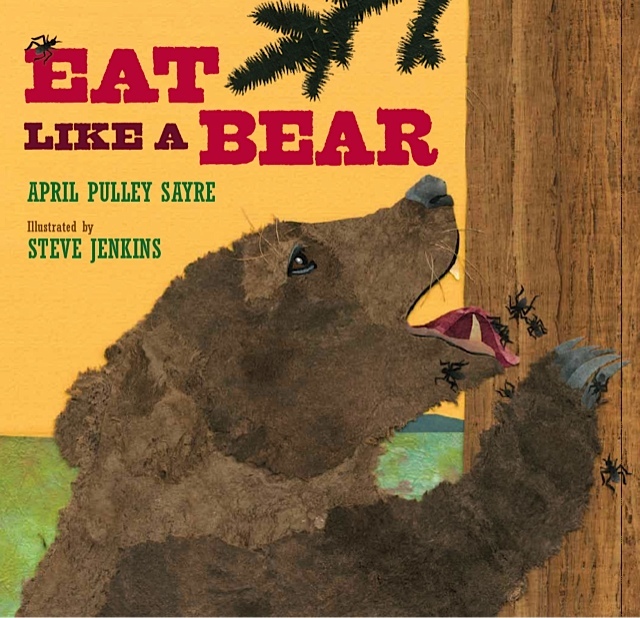 Eat Like a Bear, my book illustrated by Steve Jenkins and published by Henry Holt, just received a starred review in Publisher’s Weekly. Kirkus reviews also gave it a starred review. I’m excited that folks “get” this book. I was so pleased with every word, illustration, design choice on this project. It was a great team effort. Tilt the cover and check out the shiny ants. Notice the designer’s great backmatter fonts and layout. See a few pages on Henry Holt’s website. Okay, so I’m a little stoked about it. Guess what else thrills me: Steve Jenkins has signed on to illustrate my next three books with Henry Holt! Need I say more? Yes. Another Steve Jenkins book, one which he wrote, The Animal Book, received a starred review in PW this week. Go, Steve!